He holds a degree in Industrial Engineering from the University of Seville in 1989. He holds a PhD in Industrial Engineering from that same university in 1995. His teaching career began at the end of 1989 at the University of Seville, where he held various positions at the Escuela Superior de Ingenieros Industriales of that University, obtaining the title of Associated Professor in 1997. In 2000 begins its full dedication in the University of Jaén, obtaining the place of Full Professor of System Engineering and Automation in 2002. He is responsible for the Robotic, Automation and Computer Vision research Group -GRAV- of Universidad de Jaén, since its creation in 2002. His main lines of research are: control of robot manipulators, sensors fusion, application of automation to olive grooves and olive oil production, as well as computer vision applied to the control of the quality and automation in Manufacturing Industry. Throughout his research career he has participated in almost forty research projects of international, national and regional nature funded by public calls and cooperation networks, leading thirteen of them. He also has extensive experience in R & D projects with companies from sectors such as olive oil and automotive, of great importance in the province of Jaén. Specifically, he has been leading researcher for more than thirty technology transfer projects to companies. The participation and development of these projects has given rise to a wide scientific production, and he has been positive evaluated by the Spanish Ministry for four “six-year periods” of research activity. He has authored and co-authored more than 170 scientific publications (including papers in indexed journals, books and book chapters, and lectures at national and international conferences), having won the best work prize in three different conferences. He has also given more than a dozen lectures on robotics and automation in different national and foreign universities and other institutions. In addition, he is reviewer in several magazines – Control Engineering Practice; Revista Iberoamericana de Automática y Informática industrial; IEEE Transactions on Control Systems Technology; Optimal Control, Applications and Methods; International Journal of Robotics and Automation … – and national and international conferences of recognized prestige – European Control Conference, American Control Conference, IFAC World Conference, IEEE International Conference on Robotics and Automation, IEEE International Conference on Intelligent Robots and Systems … -. On the other hand, He has been an evaluator for the Spanish National Agency for Evaluation and Prospecting (ANEP) since 2008 and he has also been an evaluator of the National Agency of Scientific and Technological Promotion of the Argentine Republic, during the period 1997 to 1999; In addition, since 2011, he is part of the evaluation committee of the Agency for the quality of the university system of Castilla y León. In terms of thesis management, he has supervised 6 PhDs (two of them with European mention). Finally, he is a member of the following scientific committees: IEEE since January 1997; Spanish Committee of Automation (CEA) since 1999; As well as the Technical Committee on Mechatronics Systems (TC 4.2) and Technical Committee on Robotics (TC 4.3) of International Federation of Automatic Control (IFAC) since November 2011. He is also a member of the Editorial Board of the Iberoamerican Journal of Systems, Cybernetics and Informatics, from January 2014. In November of 2015 he was awarded “Doctor Honoris Causa by the Inca Garcilaso de la Vega university in Lima (Peru)” and received the award ” Sanmarquina Medal of Honor” in the Grand Cross Degree of the National University of San Marcos del Peru , Dean University of America. In the field of academic management, he has held different positions of responsibility, being now, and since March 2015, Rector of the University of Jaén. 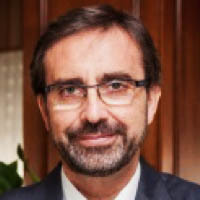 His career in university management began in 1993, as Secretary of the Department of Systems Engineering and Automation at the Higher School of Industrial Engineers of the University of Seville, which he held until September 1999. After his transfer in 2000 to the University of Jaén was named in that same year Secretary of the Polytechnic School of Engineering of Jaén (EPSJ). He later became deputy director of the center. Finally, from 2006 to 2014, he has held the position of Director of this Higher Polytechnic School (EPS). Also, he has been president of the “Internal Quality Assurance Commission” of the EPSJ. On the other hand, he has been an elected member of numerous councils and committees of the University of Jaén, emphasizing membership in the Governing Council and the University Office (since May 2007 and June 2002, respectively). He has also been part of the Coordination and Planning Commission for Degree Degrees since November 2009; Has been a member of the Steering Committee of the “II Strategic Plan. 2014-2020” at the University of Jaén and has been a member of the Academic Planning Commission since June 2011. He has also been a member of the Research Commission for five years (from June 2007 to June 2011). He is also Vice-President of the Foundation Strategies of the Provincial Council of Jaén Emphasize that since March 2016 he has been President of the ICT Sectoral Commission of the Conference of Rectors of Spanish Universities (CRUE) and member of the Executive Committee of CRUE.